“We are not very happy with the CEO of Volkswagen!” Jorgo Chatzimarkakis – a former member of the European Parliament who in 2016 became the secretary-general of industry association Hydrogen Europe does not hide his disappointment with the recent announcement by VW Chief Herbert Diess and his colleagues from BMW and Daimler. Chatzimarkakis is full of ideas when it comes to promoting hydrogen. But despite his annoyance with German car companies, it would be a mistake to think that the hydrogen sector is betting only on mobility. I discover that much, when I speak with him on the phone -- ‘Mr Hydrogen’ as he is sometimes called in Brussels -- to find out how the European hydrogen sector views its future. Mr Hydrogen believes the existing fossil fuel industry, led by companies like Shell, will play a key role in the decarbonisation of the energy sector if the right incentives are in place. “According to the new Renewable Energy Directive, which was adopted by the EU last year, refineries will be allowed to use emission-free hydrogen in their products to meet their greenhouse gas reduction targets. Georgios “Jorgo” Chatzimarkakis, who has German and Greek nationality, was born in Duisburg, Germany, in 1966. He holds a degree in agriculture and politics from the University of Bonn, worked for the Germany foreign office, and as an associate professor in the field of European politics. He was a member of the executive board of Germany’s liberal party FDP (Free Democrats) from 1995 to 2011 and secretary-general of the SDP branch in the German state of Saarland from 2002 to 2010. From 2004 to 2014 he was a member of the European Parliament. He was appointed special envoy for the Greek government during the financial crisis. 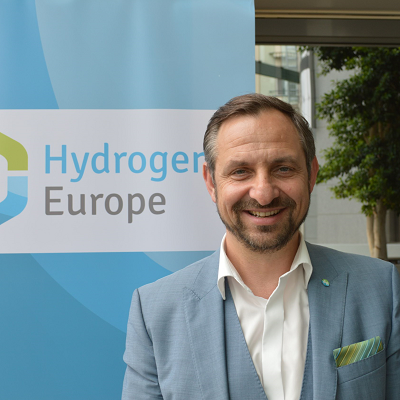 In 2016, he became head of the European industry association Hydrogen Europe, which represents more than 100 industry companies, 68 research organisations as well as 13 national associations. Hydrogen Europe partners with the European Commission in the innovation programme Fuel Cells and Hydrogen Joint Undertaking (FCH JU), under which the hydrogen sector received €1.4bn in EU subsidies over a seven-year period.